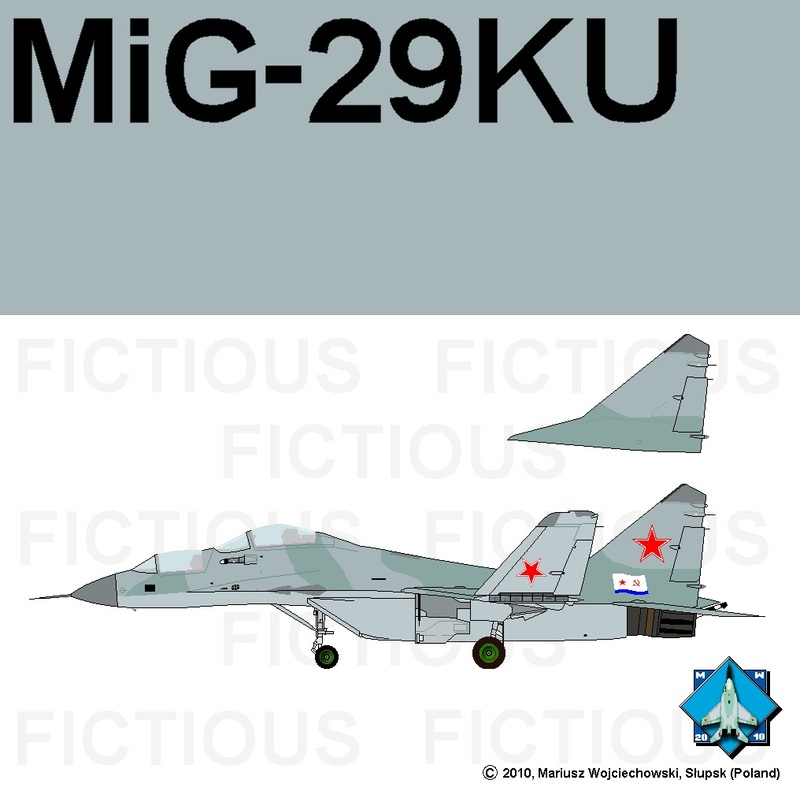 Product 9-31 it's the prototype of the MiG-29K, shipborne variant of MiG-29, for type 1143.5 aircraft carrier "Admiral Kuzniecov" ("Tbilisi" then), developed in base of MiG-29M (9-15) airframe with arresting hook, in-flight refueling probe, engines RD-33K, new avionics, strengthened landing gear, nine hard points for armament, wider wings (folded). First flight 1988, pilot Toktar Aubakirov, first landing on deck in 1989. 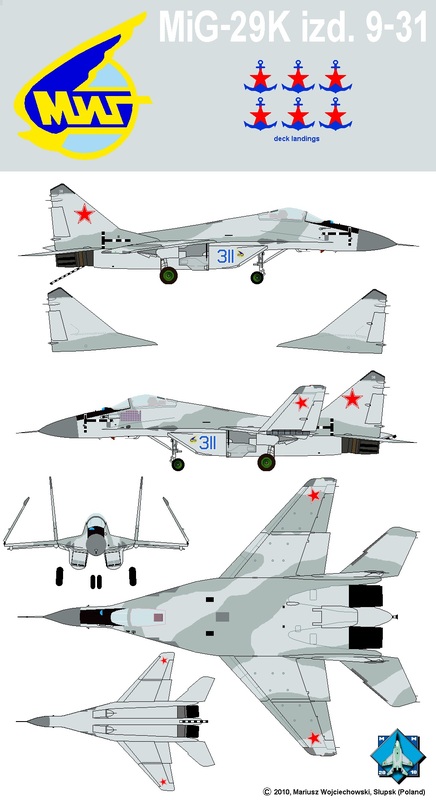 When Soviet Navy choose Su-27K (Su-33) for carrier, program was suspended between 1993 and 1996. Only two prototypes are built. 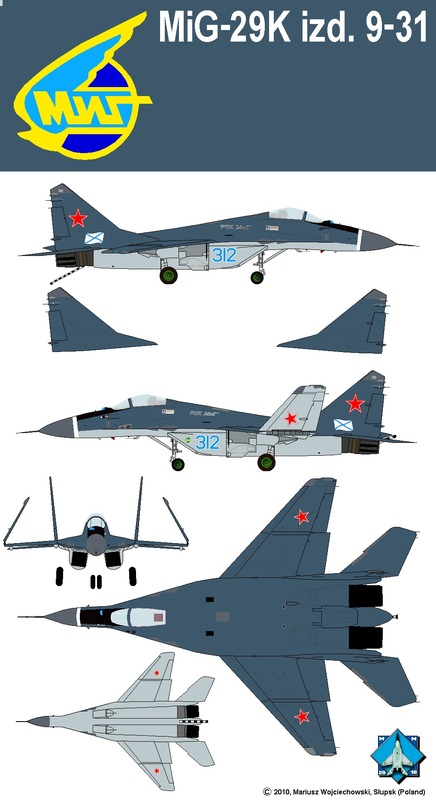 MiG-29KU was never built. MiG-29KU (izd. 9-62) could look like this. Drawing accuracy: 0%. Drawing is fictious, one side only, and rather not serious. 9-31 first prototype, Russia, about 2001 (? ), see many anchors and stars on fuselage - each for one landing on carrier's deck. Black and white "T" are used during flight test as photographic markings. Soon aircraft will be repainted as #312, in 2001. Drawing accuracy: 100%. 9-31 second prototype, Russia, about 2001, when renovated aircraft was offered to Indian Navy. Drawing accuracy: 100%. In 2001 MiG-29K was offered to Indian Navy, for type 1143.4 aircraft carrier "Admiral Gorshkov" (former "Baku", now "Vikramaditya"). After years, on base of the MiG-29K experiences, naval aircraft for Indian Navy was finally created and even sold, but it's a different aircraft and story, see MiG-29K and MiG-29KUB, 9-41 and 9-47.